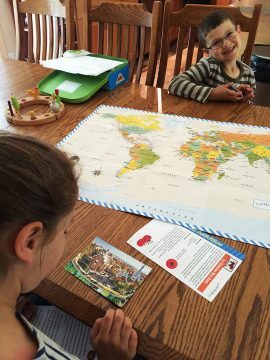 The kids ripped into their latest Little Passports package, spouting all the Spanish words they could think of. But that was just the beginning of the fun-filled afternoon at our casa because this package had lots of new things for us to try! We started by spreading out our big world map on the table and looking for Spain. The second thing that caught our eye was the suitcase sticker: it had an image of a delicious rice dish on it! 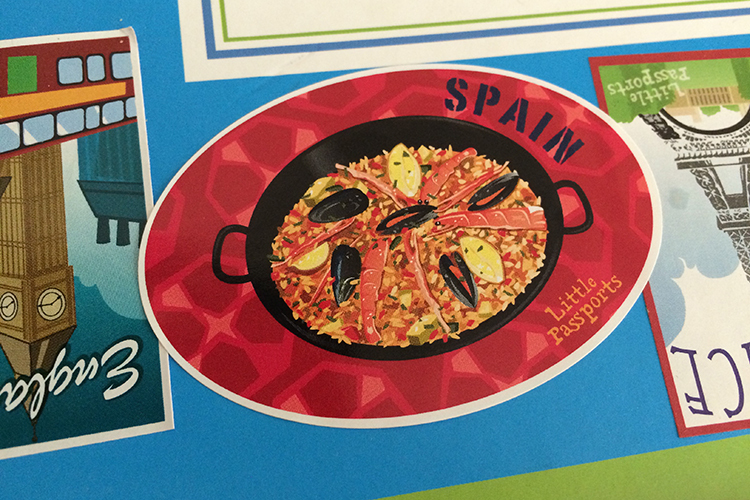 Sure enough, a mouthwatering recipe for paella was included in our activities booklet. New recipes are some of our favorite Little Passports activities, so we took a quick glance at the ingredients and decided we could whip this up for dinner. The kids bustled around the kitchen, pulling out all the ingredients and lining them up on the counter; I took out the meats to thaw for later. Back at the table, Noah discovered our Spain souvenir: a castanet! He and his sisters tried a few rhythms before reading the letter. Running with the bulls in Pamplona, walking the cobblestone streets of Seville’s Old Jewish Quarter, savoring tapas and dancing flamenco: the letter painted a lively, colorful picture of Spain in our heads that was underlined by the beautiful picture postcard of Park Guëll in Barcelona. And while we waited for the meat to thaw to begin preparing our Spanish feast, we decided to take a stab at the craft idea: tomato rice bags. We read about La Tomatina, a Spanish festival that is essentially one of the world’s biggest food fights. Throwing real tomatoes at each other is probably best done in Spain, I warned the kids, but we could make these adorable tomato rice bags. All three of my kids found the bags super easy to make. 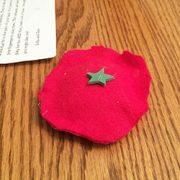 It only took a few cuts of red and green felt, some hot glue (you can use superglue instead) and a few handfuls of rice to quickly put them together. Armed with a few of these “tomatoes”, the kids did not hesitate to reenact their own version of La Tomatina Festival. Let’s admit it: watching your kids pelt each other with tomatoes they made themselves is amusing for everyone. Dinner hour was approaching, though, and so we turned our attention back to the kitchen. Time to chop, marinate and sauté. In a matter of minutes, the kitchen smelled so good! We took turns adding ingredients and accompanying our culinary efforts with rhythms on the castanet. We searched YouTube for some flamenco music, and when Daddy walked in the door, we had turned our humble kitchen into a quaint, Spanish restaurante. All in an afternoon’s work!